What a beautiful beach. What a great nightclub. What a terrific place to host your wedding reception. The establishment plays many roles, and plays them to perfection. 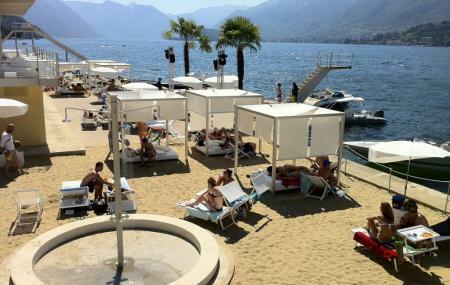 The beach is long and peaceful, stretching from Bellagio to Villa Melzi. If you want to sunbathe with some snacks, you can rent lounging equipment from the establishment. At night, the relaxing beach turns into a vibrant party hub, one that you can hire for a birthday, a bachelor’s party or even corporate events. Heck, you can take the party all the way out to a limousine boat. And you can entirely outsource your wedding party to them too! Check out the attraction website for prices regarding renting of equipment such as sunbeds, umbrellas and gazebos. Items are rented out on an all day or half-day basis. Check the website for birthday and bachelor party prices. Buses to Bellagio can be found right outside. How popular is Lido Di Bellagio? People normally club together The Garden Of Villa Melzi Or I Giardini Di Villa Melzi and Enoteca Cava Turacciolo while planning their visit to Lido Di Bellagio. Wonderful place to spend the day in the summer. You can book a sun bed or a more personal Gazebo if you’re more that one person or just want the privacy. Good service. No pool as advertised though. Use water shoes to go into lake, sharp rocks. Else it’s a great and becomes a club at night. One of the most beautiful places in the world during the warm season. Highly recommended. Absolutely stunning location. Beautiful scenery, plenty of places to eat and drink and wonderful for wandering around the cobble street shopping lanes. Be warned lots of uphill lanes for the shopping. Well worth a visit for just a day or a longer stay. Good place with three different levels. The lowest touching the lake shore. If you don't have water shoes for those rocky Como beaches, the Lido provides soft sand for your toes. Also beach chairs, cabanas, umbrellas, a restaurant and a bar for the requisite Aperol spritz. Reasonable entry fee (maybe €6? ).